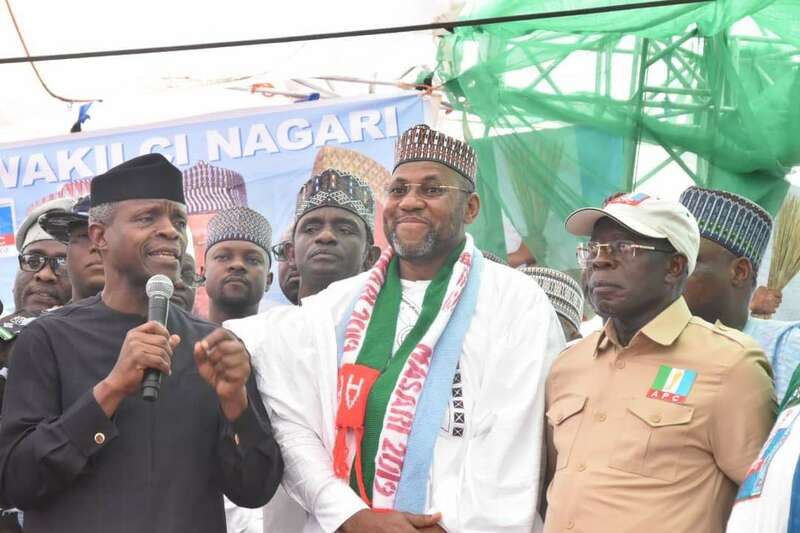 The Independent National Electoral Commission, (INEC) has announced candidate of the All Progressives Congress (APC), in the Katsina North Senatorial zone, Ahmad Babba Kaita, as the winner of the Saturday by-election. He polled 224,607 votes to beat his closest opponent, the Peoples Democratic Party candidate and his elder brother, Kabir Babba Kaita, who scored 59,724 votes. The commission also announced Lawal Yaya Gumau, who also contested the Bauchi South Senatorial District on the platform of APC as the winner during the elections in the state. Gumau polled 119, 489 votes out of 256, 753 votes cast to beat Ladan Saliu of the Peoples Democratic Party, who polled 50,256 votes to become a runner up. Both Kaita and Gumau are current members of the Federal House of Representatives (representing the Kusada/Ingawa/Kankia Federal Constituency) and Gumau represents the Toro Federal Constituency of Bauchi State. Returning Officer, Prof. Hudu Abdullahi, of the Ahmadu Bello University, Zaria, who announced the results listed votes scored by the other political parties as GPN 1056, DA 796, MPN 633 and MMN 343. Abdullahi, who described the election process as “free and fair,” added that out of the total number of 864,046 registered voters in the zone, 308,500 were accredited with 237,159 valid votes recorded and 26,050 invalid votes. INEC Returning Officer for the election in Bauchi, Prof. Ahmed Sarki Fagam said Yahaya polled a total of 119, 489 votes out of 256, 753 to beat Ladan Saliu of the People’s Democratic Party (PDP), who polled 50, 256 votes to become a runner up. The results also showed that the immediate past Governor Isa Yuguda, who contested on the platform of the Green Party of Nigeria (GPN) scored a total of 33, 079 votes. Hussein Umar of the New Nigeria People’s Party (NNPP) polled a total of 22, 896, while Aminu Tukur of the All Action Party (APP) got 11, 717 while Maryam Bagel of the Social Democratic Party (SDP) managed to get 3,800 votes. A breakdown of the figures revealed that APC swept Alkaleri, Bauchi, Dass, Kirfi, Tafawa Balewa and Toro Local Government Areas, while PDP won Bogoro Local Government Area, the home base of Speaker Yakubu Dogara. Results obtained from INEC data centre indicated that a total number of 877, 160 voters were registered, with accredited voters of 271, 703. A total number of 245, 652 valid votes were recorded, with 11, 111 votes rejected. The total of votes cast was 256, 763, with no fewer than 51, 460 votes cancelled in Alkaleri, Bauchi, Tafawa Balewa, Bogor and Toro. In his reaction after the announcement of the results, former Speaker of the Katsina State House of Assembly, Alhaji Umar Gwojo Gwojo, commended the voters for their faith in the APC and President Muhammadu Buhari. But while reviewing the election process, Katsina PDP Chairman, Salisu Majigiri, alleged what he described as “vote buying” perpetuated by the APC. “We have evidence to prove that in 99 per cent of the polling centres, the APC engaged in vote buying.” he alleged. However, Speaker of the Katsina State House of Assembly, Abubakar Kusada, who monitored the exercise at his Kusada Local Government area, said that there were no manipulations of any sort. Everything went on smoothly and the voters-turnout was quite impressive. Meanwhile, Peoples Democratic Party, PDP stakeholders in Kogi State have called for the cancellation of the Lokoja/Kogi Federal Constituency, which also held on Saturday. Chairman of the Kogi State chapter of the PDP, Samuel Ohuotu, alleged that the by-election was characterised by violence, ballot box snatching, vote buying, intimidation of the electorates by armed thugs, allegedly aided by officers of the Special Anti-Robbery Squard (SARS). Ohuotu, who said they have already petitioned the INEC over the matter, alleged that officials of the Kogi State government were seen at various polling units engaging in vote buying, violence and harassment of the electorates during the election. Appointees and key officials of the Kogi State government who were not indigenes or voters in the Federal Constituency were seen intimidating and harassing the electorate with armed thugs and officers of SARS and police personnel of the Nigeria Police.